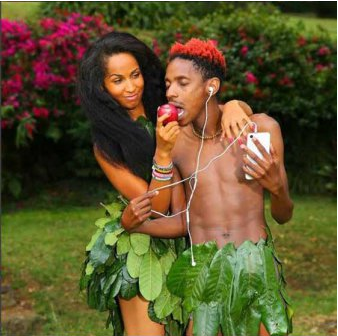 Having made headlines for many reasons in the past, comedian Eric Omondi has recently been flaunting his girl Chanty who is always present wherever he goes. The couple who have an upcoming show together, which is scheduled to take place next week have been posting some photos to prepare fans on what's coming. As fans anxiously wait for the date, Eric and his sweetheart posted a photo on social media dressed only in leaves.